This is my 5th year playing roller derby! What’s the most important piece of kit you have? Why? I’m going to say Riedell R3 skates. I’ve had these entry-level skates for way too long and I know I should have upgraded them years ago, but they have been with me from the very beginning. They’ve seen all kinds of games and they’ve done a pretty good job of holding together. Well done R3s, I love you and please hold together until I can afford your replacement. What’s the best piece of advice you could give? Don’t spend too much time comparing yourself to other players. Compare yourself to yourself, look back and recognise the progress you’ve made, set yourself goals and areas to work on and learn from those around you. Gem Aargh is giving me piggy back ride through the main hall but then she started running. She tripped up and sent me flying across the floor. I slid some distance and The Ruth Hurts then had to run over to pull up Gem’s leggings that had slipped down. Did you skate before you started roller derby? I used to skate on inlines around the age of 11. The road was really smooth on our street so it was awesome! 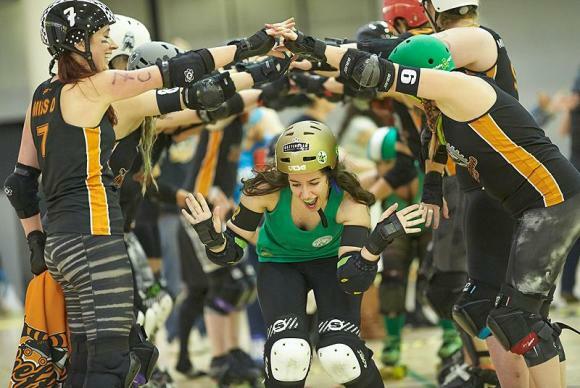 How has playing roller derby affected your overall health and fitness? I was pretty unfit before roller derby. Sometimes I would get out of breath walking up stairs which isn’t ideal. Exercising was something I knew I had to do but never wanted to do. But then I fell in love with skating and stopped worrying about losing weight or getting fit, and focused on all the cool things I wanted to learn how to do on skates. Turns out, that helped with my fitness. I realised that I actually liked exercising. I voluntarily signed up to skate a marathon and completed it. I can now do several press-ups. I have a gym membership. I can win arm-wrestling contests. I can lift cars, etc. Screw running though, still not down with that. How often do you practice on skates? Have you sustained any injuries playing roller derby? Thankfully nothing major. I once elbowed myself in the ribs and bruised something; I was really scared of sneezing for some time. My shin suffered after skating straight into Doodlebug in between jams. I’ve also ended up with a bust-up lip after an intraleague game. What’s your favourite roller derby photo of you? This was taken at the end of our last game in 2014 which was against Sheffield Steel Rollergirls. It was a really nice way to end what had been quite a challenging and intense year. We were at a familiar venue and the atmosphere at the event was great. We had made our way there together on the (party) coach, we were being ridiculous most of the time and we had a lot of good energy. We played really well and it didn’t feel like we had lost a game. I had such a good time playing against SSRG and it’s the closest our scores have ever been with the Sheffield teams. 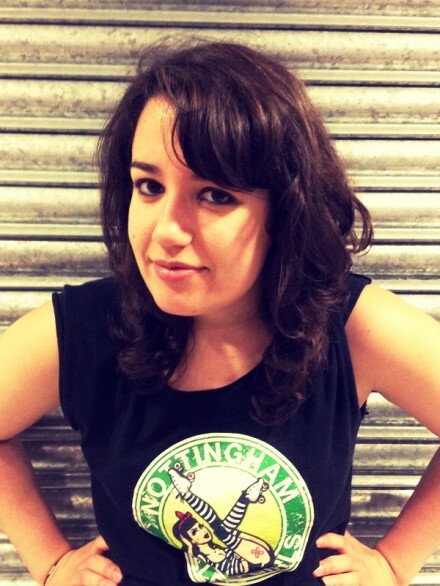 An indicator of how far we’ve come since our very first game as Nottingham Roller Girls vs the Sheffield Crucibelles. Basically, I had the best time that day and this photo sums that up for me. Amy Poehler. That woman is wise and hilarious. What is your favourite position? Jamming. Sometimes it terrifies me, but I love that. What is your post-game refreshment of choice? Rum and coke because gin and tonics make me cry. If you had a theme tune what would it be? This entry was posted in Player Profiles by Kat Chmee (ed). Bookmark the permalink.